Louvi, as we call it in Cyprus, are the black eyed beans. Although the word “louvi” is ancient Greek from lovion, plural lovia (λόβιον, πλ. λόβια), in Greece this word is not used any more. Instead, they are called fassolia mavrommatika, which means black-eyed peas. In Cyprus the dried ones are called louvi xero and and when they are still green and tender they are called louvi fresko, whereas in Greece they are called ambelofassoula. Fresh black-eyed beans (Louvi fresko) can be eaten as a main dish but also as a salad to accompany other dishes. Louvi xero can be eaten as a stew with chard but also as a salad. Fresh Louvi me Kolokoui (a special variety of Marrow). On the right side there is a platter with “poulles”. Poulles are baby taro (kolokassi). They are peeled same as taro, without washing them, cut them in the middle and fry them (I fry them in olive oil). I remove the oil, put them back in the frying pan and add coarse sea salt, crushed coriander and lemon juice. They are served as a side dish. Dried legumes are among the most nutritious foods available, because they are a good source of protein and can be a healthy substitute for meat, (which of course, has more fat and cholesterol than dried legumes). Now that I am strictly following the Mediterranean Diet, I make it a point to prepare and serve dried legumes, at least once a week. I am steadily losing about 1 kilo a week and that is a great achievement for me. Black eyed beans are considered nutritious with a protein content of about 23%, fat content of 1.3%, fiber of 1.8%, carbohydate content of 67% and water content of 8-9%. As in most legumes, the amino acid profile complements cereal grains. It also contains nictinic acids, vitamins A, B1, B2 and C; and is an excellent source of calcium and folate. The properties of Chard are so many that I will have to write all day. They are rich in vitamins Κ, Α, C, Ε. They are also rich in antioxidants, magnesium, potassium, iron, fiber and if you would like to learn more, please read the link provided to learn about its other properties. Matched with the black eyed beans, which are rich in protein, olive oil and all the other ingredients contained in this dish you can understand how healthy and nutritious this is. My mother used to cook Louvi me Lahana and to be frank I did not like it very much. I am not sure exactly how she cooked it but I am sure that she did not sauté the onion and she definitely did not add garlic. She probably just boiled the beans with the chard and when serving we added olive oil and lemon juice. I am sending this recipe to Tobias, of Tobias Cooks for his 8th Mediterranean Cooking Event: Cyprus. For those of you reading my blog for the first time, you may find out about The Mediterranean Diet and find more Healthy Recipes here . Also in my Cookbook More than a Greek Salad, which is more than a cookbook, as in there you will find all you need to know about the Mediterranean Diet, plus 250 healthy Greek recipes, as well as a selection of recipes with with their calories to choose from, in order to program your diet plan. Louvi, as we call it in Cyprus, are the black eyed beans. Although the word “louvi” is ancient Greek from lovion, plural lovia (λόβιον, πλ. λόβια), in Greece this word is not used any more. Instead, they are called fassolia mavrommatika, which means black-eyed peas. Put blackeyed beans in a pot with water and boil for 15 minutes and drain. Meantime, wash and cut silverbeet in smaller pieces. Sauté the onion and garlic with olive oil and then add silverbeet and stir. Add the beans and season with salt and pepper. Add lemon juice and water to cover all ingredients. Bring to boil, reduce heat and cook on low heat until the beans are soft. Turn off the heat and mix in the parsley and dill. Serve with a drizzle of olive oil and lemon juice (optional). In many countries, louvi xero (dried black eyed peas) must be soaked in water overnight. Follow the instructions on the package. In Cyprus and Greece this is not necessary. I made a minor change to my above recipe. I did not add the lemon juice as stated above but left it to be added at the end. I dissolved 1 tbsp flour in the lemon juice and added it just before adding the parsley and dill. The broth thickened slightly to a light sauce. No addition of extra lemon juice and olive oil was necessary. When dissolving the flour in the lemon juice, if you see lumps, just pass it from a tea strainer and with a spoon mix until the lumps break. The traditional Cypriot recipe is included in my cookbook Mint, Cinnamon & Blossom Water, Flavours of Cyprus, Kopiaste! available on all Amazon stores. a very healthy ,dish,ivy!i wish you a great week-end! Yum! I've never cooked with these beans before. The whole dish is full of goodness Ivy. Very healthy and since I adore all the different kinds of beans and seeds, I am sure this would be my type of dish too! I have never cooked anythng with chard. This looks so good. Teresa, I am fine thank you and yes my friend, it's another name for black-eyed peas. A very tasty and healthy dish Ivy! I almost bought chard at the market yesterday but switched it for kale. But I bet that would be ok to use too. Reeni, I think kale would be a good substitute. Very nice, Ivy. I will replicate it with kale: I started harvesting some from my little garden. And I have some black-eyed peas in my pantry. Great Simona. You are lucky to have a garden with veggies. Oh, Ivy, this looks absolutely delicious! 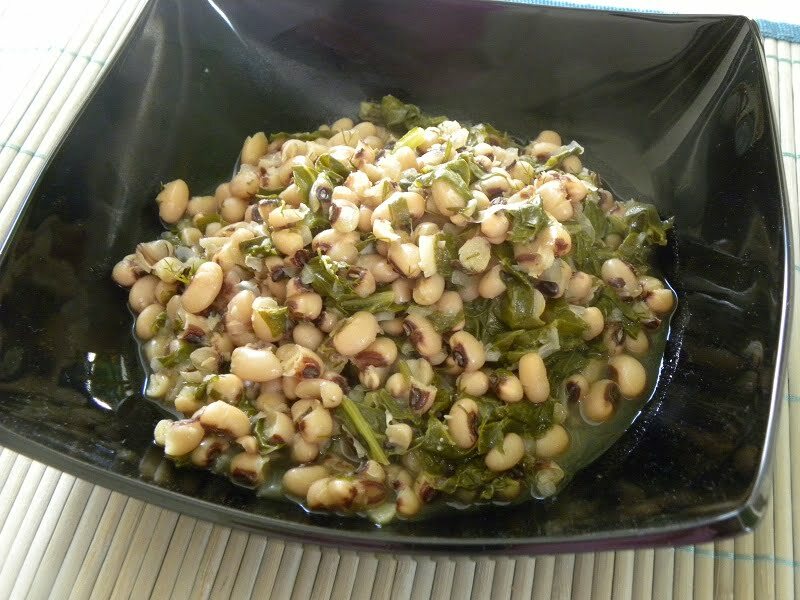 I grew up having black-eyed peas American Southern style flavored with bacon and chopped green beans, served with boiled turnip greens and cornbread on the side. We only ate this once a year, though, on New Year's Day, because black-eyed peas are supposed to bring good luck for the new year. I would LOVE to try them Greek-style! I'll definitely make this and let you know how it goes. Hi Abigail. I've read in many blogs that they are considered to bring good luck. Now they'll bring both good luck and good health 🙂 I'dd love to hear if you liked them. It looks delicious … and healthy as well ! Nice to meet you Helen and thanks very much. I know this is healthy and nutritious but I don't often cook with black-eyed beans and chard. Thanks for the reminder. That is so funny! In Lebanon we also have a black eyed beans and chard recipe! so many similarities between the two cuisines. Yummy and nutritious is right and congrats on your steady loss of kilos! I LOVE chard and it's so good paired with beans. I must say that although I like black eyed peas, I don't think I've ever made them on my own. I'll have to work them into our bean rotation – we eat a lot of beans here too! Hi Ivy, the roundup and voting is online have a look! Ivy mou , ta mayromatika ginontai kai me kolokythakia stin kypro????????? My recent post Natural beauty secrets before tonights party! Chronia polla Elena. To fresko mavrommatiko (louvi) ginetai me megalo kolokythi prasino kai to xero ginetai me kokkini kolokytha.